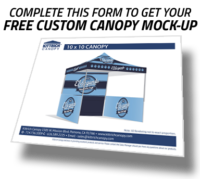 Please fill out the form to receive a free quote for your canopy project. After you send us your information, we will contact you within 24 hours to follow up and send you a free mock up with your custom graphics and logo. If you have any other questions or would like to talk to us directly, please feel free to call us at (719) 422-6679 or email sales@kittrichcanopy.com and we’ll do our best to answer your questions.